How do you get inspired from other types of creative fields that are similar to, but not exactly the same as, your own? 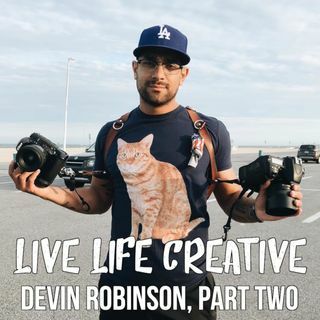 Devin shares some tips from his own life where he gets inspired in today's conversation, along with a whole lot more. Before we jump into that, you can connect with me personally on Instagram, follow @livelifecreativepodcast, or find Live Life Creative Podcast on Facebook as well. I also wanted to share some good news with you, we just hit 700 total downloads from all the episodes! Thanks for listening along and sharing it with your friends.